Karch Kiraly’s top-ranked U.S. women’s team moved one step closer to its goal of capturing the Americans’ first volleyball gold, defeating Japan in straight sets Tuesday to reach the semifinals. The U.S. won 25-16, 25-23, 25-22 and has dropped five sets all tournament. RIO DE JANEIRO – The U.S. women’s volleyball team knows Japan so well that long points are a given. Patience is a must. Against perhaps the best defensive team in the world, balls are going to come back across the net. Coach Karch Kiraly’s top-ranked Americans moved one step closer to their goal of capturing the program’s first volleyball gold medal, defeating familiar opponent Japan in straight sets Tuesday to reach the semifinals. “Before we go into any match with Japan, we have to know we need to have a lot of patience,” outside hitter Kim Hill said. The unbeaten United States won 25-16, 25-23, 25-22 and has dropped a mere five sets all tournament. The Americans (6-0) will face Serbia, a straight-sets winner over Russia, in Thursday’s semifinals. 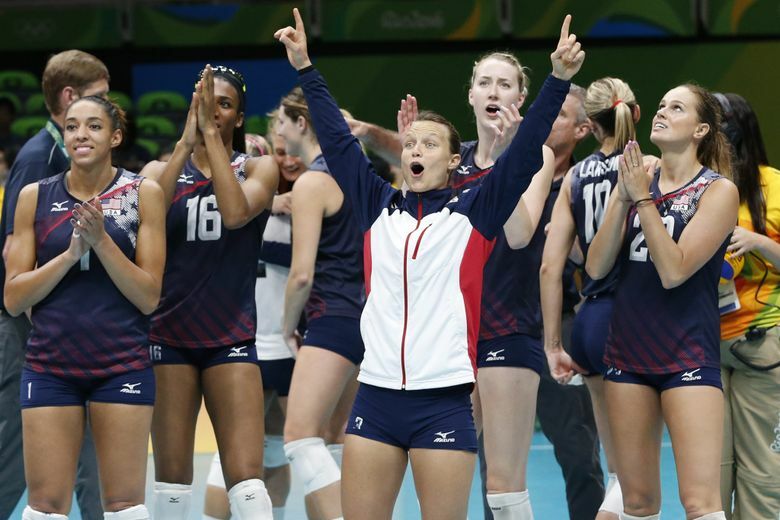 The United States won’t be playing volleyball against two-time defending champion Brazil. The hosts were upset by China, which rallied from losing the first set to win 15-13 in the decisive fifth set. Brazil’s players were in tears afterward. The United States has faced Japan more times than any other team since 1983. The Americans have won the last three meetings on the Olympic stage against Japan, opening the 2008 Beijing Games with a four-set victory and sweeping Japan in a match at the Atlanta Olympics in 1996. Japan, one of the top defensive teams in the world, had a 7-0 run in the third set before the Americans closed it out. The Americans, who settled for silver at the last two Olympics, are two victories from gold. “I don’t have any expectations. Others may have them, but I don’t,” said Kiraly, the only person to win gold as a player in beach and indoor volleyball. Serbia lost in four sets to the United States during pool play, but pulled off a surprising five-set victory at last year’s World Cup in Japan that forced the Americans to qualify for Rio in Lincoln, Neb., in January.